If you think the SharePoint security model shields you from any security – or, more precisely, privacy – concern when it comes to your public-facing SharePoint sites, think again. As a matter of fact, privacy has never been a huge concern for SharePoint, simply because SharePoint was originally built for – and still mostly caters to – internal users who want to collaborate with each other. However, over the years, SharePoint usage has gone beyond intranets and crossed over to extranets and even public-facing, anonymous web sites. Microsoft has acknowledged that shift and even encouraged those alternative usages of SharePoint, for instance by issuing detailed extranet topologies. However, one area that is often overlooked in extranet scenarios is the privacy area, and more specifically, the answer to the following question: can I guarantee that my external users don’t know about each other, unless I want them to? Can I guarantee that my external users don’t know about each other, unless I want them to? 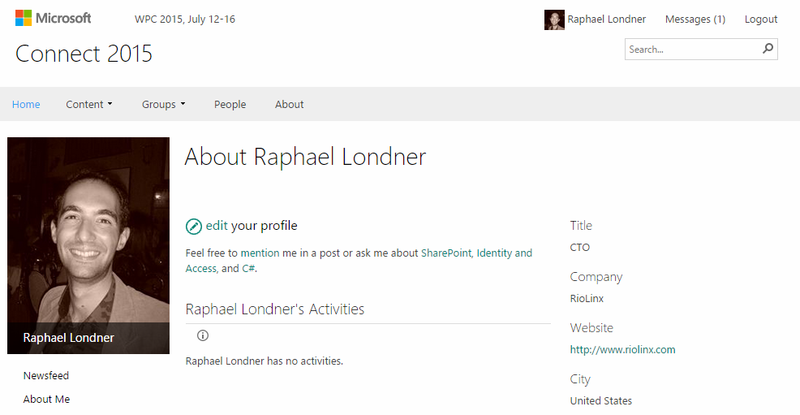 Of course, you can also access your colleagues’ information through the dedicated People Search of SharePoint Server (if it has been enabled) and there are probably some other ways to sift through your colleagues’ professional profiles. 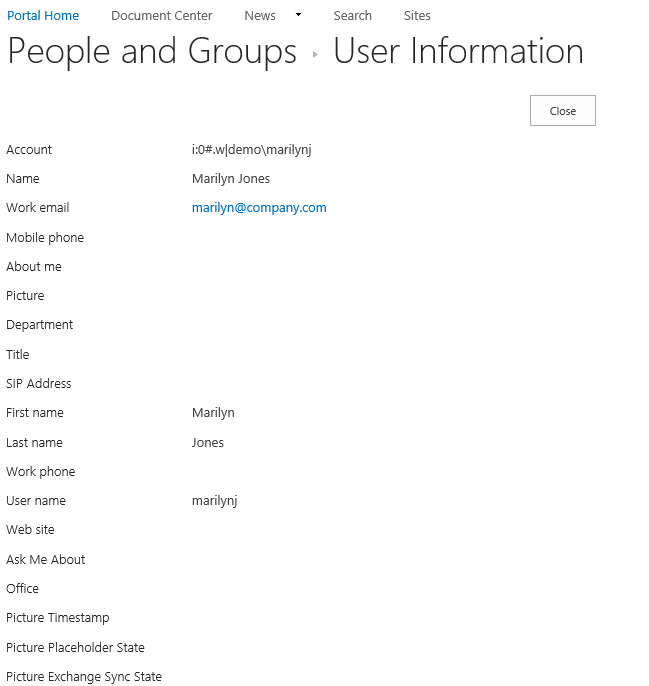 But unless you are really looking for someone (and you have access to some People Search engine), in 99% of the cases, you will access those profile pages when you click on the author of a document (or list item) or on a person assigned to a task (and more generally any Person field in a SharePoint list). So what “privacy hole” are we talking about here? Good question, indeed! At this point, you might feel like this privacy hole has to do with the 2 profile pages I mentioned above and you would be right indeed! But in order to properly answer that question, we must investigate a bit more what those profile pages are and how they work. The SharePoint Foundation User Information page (also referred to as the “userdisp.aspx page“) is a page hosted in the _layouts folder of SharePoint, more precisely at [SiteUrl/_layouts/userdisp.aspx (which redirects to [SiteUrl]/_layouts/15/userdisp.aspx in SharePoint 2013). 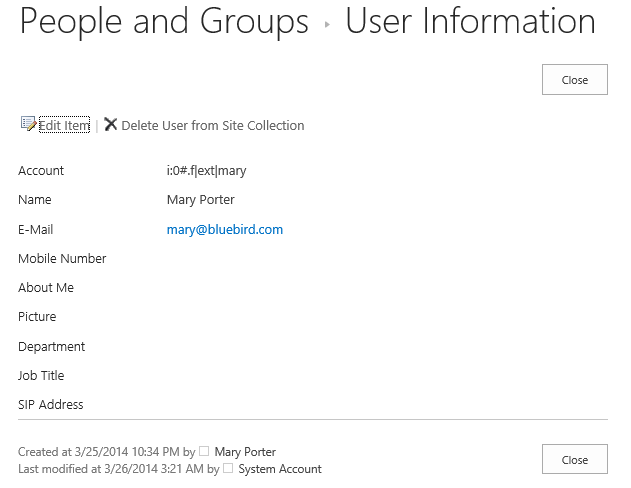 This page displays the user information available in the SharePoint’s User Information List, a hidden list only site collection administrators and site owners can access at [SiteCollectionUrl]/_catalogs/users. If you only use SharePoint Foundation, whenever you click on ‘My Settings’ in the SharePoint Welcome Menu, you will redirected to that userdisp.aspx page. For instance, if you are browsing a page in the http://partners.company.com site, your ‘My Settings’ page will always point you to http://partners.company.com/_layouts/15/userdisp.aspx (or http://partners.company.com/_layouts/userdisp.aspx in SharePoint 2010). Conversely, whenever you click on a person’s name, you will be redirected to that userdisp.aspx page with an ID parameter followed by an integer. For instance, the Url of the page could be http://partners.company.com/_layouts/15/userdisp.aspx?ID=15 . The ID parameter corresponds to the internal ID of the user in the User Information List and is incremented every time a new user signs in. For SAML users (i.e. users who authenticate through a Trusted Identity provider such as ADFS), you will most likely only see the Account field, unless some further processing is done on the SharePoint side (at least, that’s my current understanding, but SharePoint may be smarter if your identity provider provides some claims SharePoint knows how to process). You can’t really customize that page or disable/hide some fields, unless you want to go with programmatic changes that are most likely unsupported. 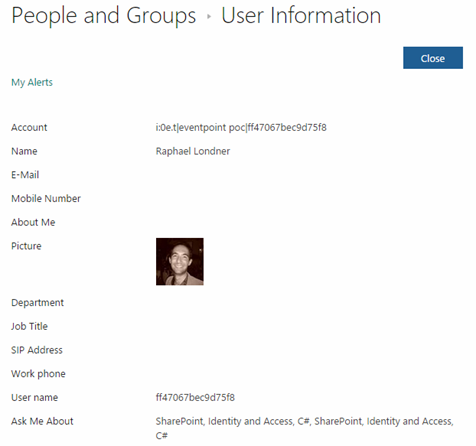 The SharePoint Server profile page (later referred to as the “Person.aspx”) is a page hosted in the ‘My Site’ site collection you’ve chosen to associate with your web application (through its association to a User Profile Service Application). It’s usually separate from your own site collection, but that’s not always the case and you could choose to host it in a site collection under your “content” web application. That’s usually what’s done on public web sites, such as the Microsoft WPC site where the Person.aspx page is hosted in the https://connect.digitalwpc.com/sites/my site collection. SharePoint Server simply adds an accountname parameter and the value of the parameter is the SharePoint-encoded account name of the user, e.g. i:0#.w|domain\user (note that you have to replace the ‘#’ sign with %23, which is the HTML-encoded version of ‘#’ for the url to work). For forms user, the accountname parameter value would be slightly different (i:0%23.f|[membership_prefix]|[account], for instance i:0%23.f|ext|ron for a ‘ron’ FBA user). For SAML users, the parameter would reflect how SharePoint encodes these accounts (the prefix for SAML users is seemingly random, but can actually be set to a specific value when initially registering the identity provider with SharePoint). The general format of accountname parameter value is i:0[idp_uid_claim_type].t|[idp_name]|[user_id] and if you want to know more about those cryptic account names, head over to Wictor Wilen’s excellent blog post on SharePoint claims encoding. 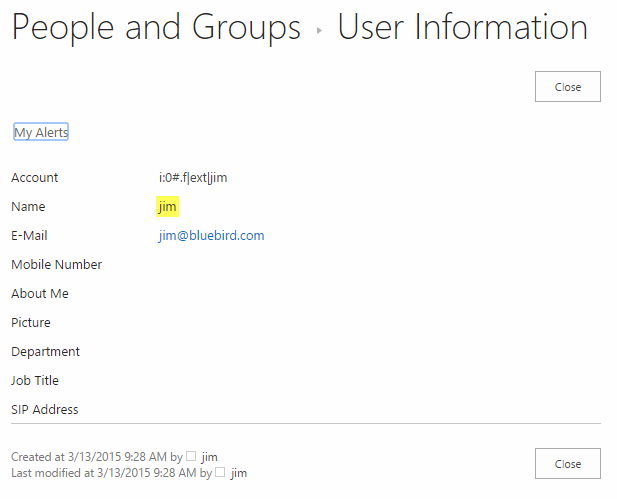 Can I access the User Information page even on SharePoint Server sites? The answer is: Yes! As a matter of fact, SharePoint Server itself directs all person links to that page before redirecting to the SharePoint Server profile page. You can witness it by moving your mouse over a person link on a SharePoint Server site in Internet Explorer and by looking at the link in the left hand side. Note: there are quite a few more user properties here than in a SharePoint Foundation farm, because some SharePoint Server user profile properties are marked as Replicable and will automatically be created in all User Information Lists of your SharePoint farm. 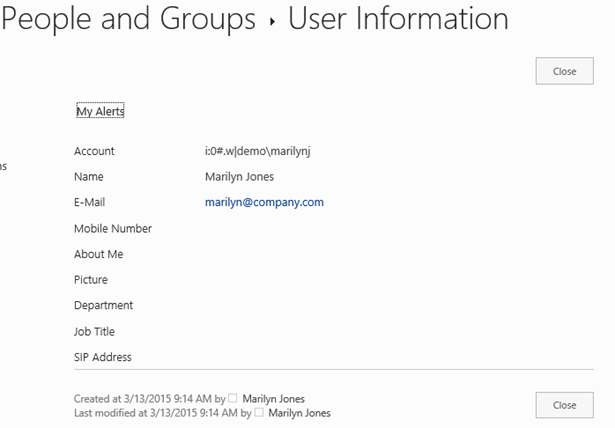 You can easily see that this could be a serious privacy issue, because if you have a SharePoint extranet where all of your partners, suppliers, customers, etc… sign in to access some information you share with them, they can also retrieve a lot of private information (such as account names, full names and email addresses) from your internal users, as well as other partners, suppliers, customers, etc… whom they really should not know anything about! And I really can’t do anything about it! In which situations does this occur and should I be concerned? The User Information List of the main site (https://partners.company.com ) will contain the list of ALL users (internal and external) who have at least logged in once to your site. To be fair and before you want to write an angry comment, this privacy issue doesn’t necessarily always occur, even in extranet scenarios. That’s why, in the “almost any user that has access to a SharePoint site…” sentence above, I inserted the ‘almost’ keyword before ‘any user’. Indeed, some will likely tell you that this privacy loophole really only occurs when users have the “Browse User Information” permission, which is technically true. The problem is that this permission is by default enabled on all the default SharePoint permission levels (Read, Edit, Contribute, etc…), so virtually all users that inherit at least the out-of-the-box ‘Read’ permission level have that “Browse User Info” permission. You will probably think that disabling the “Browse User Info” permission is thus the solution to the issue, but suffice it to say that both from a usability standpoint and sometimes from a technical standpoint, it’s not a viable solution (take a look at the Why disabling the Browse User Information permission is not a realistic solution to SharePoint’s privacy issues blog post for more information). So, are there any solutions to this privacy loophole? Well, of course there are (otherwise I wouldn’t have written this blog post in the first place). The first option is to choose to set up your main site (https://partners.company.com) with anonymous access and grant your external users no specific permission on that top-level site. The main site will just serve as a central access point but all the content will be shared on secure, non-anonymous sub-sites or site collections. Actually, we highly recommend that you site collections in conjunction with our SharePoint Site Collections Viewer Web Part available on CodePlex instead of sub-sites. Why? If you use sub-sites, it’s highly likely that at some point in time you or someone from your organization will inadvertently grant some external users access to the User Information List, if those users are assigned the “Browse User Information” permission through a SharePoint group or permission level (more information in the Why disabling the Browse User Information permission is not a realistic solution to SharePoint’s privacy issues video). If you choose that setup, external users won’t be able to access the User Information pages on the main site, but only on the specific site collections they have access to, which should not be a problem, because these site collections should only be accessible by users they should know about. The second option is to use dedicated host-named site collections. In that setup, there is no central User Information List that contains all the users (external and internal) and external users will only be able to access the User Information pages on each host-named site collection they have access to. The third option is to use the same Profile Redirection technique SharePoint Server uses to redirect users from the userdisp.aspx page to the Person.aspx page (watch the video above for more information) in order to prevent some (or all) of your users from accessing private information about other users. Note that this option will require a solid knowledge of SharePoint development.